At the close of Term 1 and at the beginning of Term 2, students achieving all grades at or above an -A, are awarded the title of High Honors. Yesterday, on Wednesday Nov. 29 recipients of High Honors recognition received an award ceremony and banquet in praise of their hard work and achievements. At the banquet in the library media center 40 students were rewarded with a lunch-in catered by Chipotle. Sabrina Sprague and Haley Crocker. Grace Oliver scored over 100 points this year for Rockland. The cheerleaders competed for the State Championship once again. The fall sports season was a resounding success and all teams had fantastic seasons. Almost all of the Rockland teams qualified for the 2017 MIAA tournaments in their respective sports. Girls soccer made it the furthest into their tournament by winning the first two games in dramatic fashion, one of those games ending in overtime by an absolute firecracker from the 30 yards out by senior captain Graces Oliver. Here is Danielle O’Brien’s story on the girls soccer team’s season. 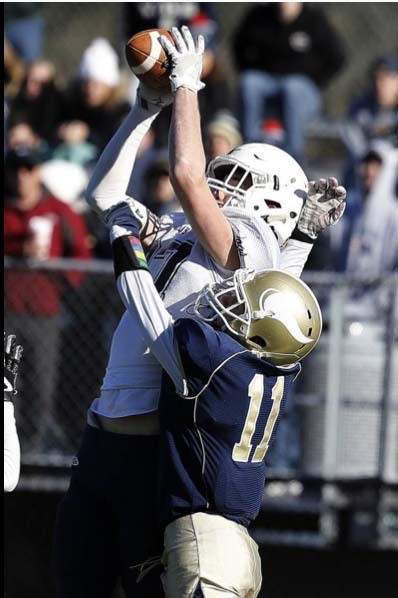 The football team wrapped up their season on Thanksgiving with a big comeback win at East Bridgewater 15-14, giving their eighteen seniors a fitting send-off. Zach Sharland had two TD’s on passes from Sam Gray. Girls volleyball made a statement this year by being undefeated league champions. They had one of the best regular seasons that this town has ever seen. The volleyball team fell short in their second game of the tournament losing to last year’s state champion, Case High School in the quarterfinals. Here is Harry O’Brien’s story about the team. The boys’ soccer team had to win their last regular season game against Hanover to qualify and thanks to a second half comeback and a score on a penalty kick, they made it, beating Hanover 2-1. Follow this link for Matt O’Brien’s season summary. Golf also snuck into the playoffs and made the tournament for the first time in over 20 years. This was a huge accomplishment for the program. Here is Mark Shield’s summary of the golf team’s season. The cheerleaders went for another state championship last weekend but came up with second place instead, a great accomplishment. They wrapped up the SSL title and South Regional title for fall cheer. Last, but certainly not least, was boys and girls cross country. Both girls and boys teams made long strides this season to improve their game but did not qualify for tournament. Next year they look to take the next step and get to their tournament dreams going. This season was an exciting one for the whole town to experience and we saw so many great moments throughout it. Click on the links throughout to access our sports page stories on each of these fall sports, and check out the Fall Sports Unsung Heroes. Boys Soccer: Jon Alvarenga, Matty O’Brien, and Vitor Santos! Alvarenga also awarded Eastern Mass All Star! Football: Jon Baar, Will Breadmore, Lou Casey, Connor Shea, Zach Sharland, Anthony DeCecco and Coach of the year Nick Liquori. 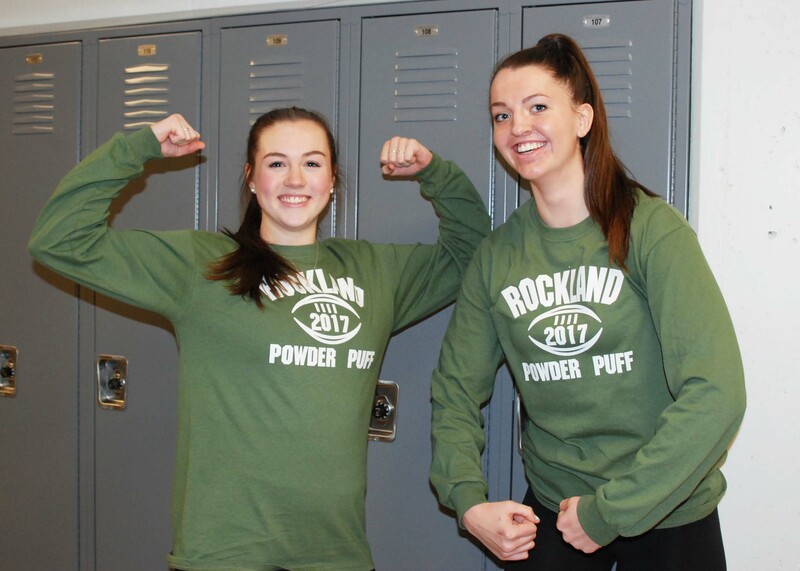 One of Rockland’s favorite community events took place at 6:30 on Friday, Nov. 17 at the Veteran Memorial Stadium, the annual Powder Puff Game! On Friday, the junior girls faced off against the seniors in a fun game of flag football. The game is played as a fundraiser for each class and the money goes to events such as the Junior/Senior Prom. During the game, the seniors had one 2 point conversion for a total of 26 points along with scoring four touchdowns. They crushed the juniors with a final score of 26-0 with two touchdowns by Lily Matson, one by Grace Oliver, and another by Sarah Lovell. The game was set up by SGC’s Finance and Fundraising Committee who is led by junior, Tyler Beatrice. The junior class was coached by CJ Armstrong, Anthony DeCecco, Mark Sprague, Dylan Kirby, and class president, John Ellard. Coaching the seniors were Lou Casey, Will Breadmore, Jonathan Barr, and Anthony Vasquez. Lastly, the game could not have taken place without help from the refs, Peter Harrison and Damien Ricci. Senior coaches including Will Breadmore (left) Ms. Hoyo (middle) and Lou Casey (right). CJ Armstrong and Caitlyn Cameron discuss the offense for the juniors. Chris Penney, Matt McGaffigan, Matt Dalton, Liam Lenihan and Jake Lauria in the announcers booth. Sydney McKenna, Michelle Downey, Janessa Libby, Hannah Boben, Jimmy Fitzgerald and Hope Geary. Jr. coach, C.J. Armstrong at the game. Ryan Struzziery is the President of the Chorus. Middle School Gym set up for the Mattress uniforms. The Mattress Fundraiser that the Music Department sponsored on Sunday, Oct. 22 was a big success. The Music Department received a check from Custom Fundraising Solutions for $4,930. The fundraiser was held from 10-5 in the Rogers Middle School Gym. The value of the mattresses, all brand new and some 50% off retail price, drew many to the event. The proceeds will be used by the Music Department programs. Lily Matson and Erika Ochenduszko are ready for tonight’s Powder Puff challenge from the junior class. Because of the rainy weather, the annual Powder Puff game is scheduled for tomorrow night (Friday) in the Rockland Veteran’s Memorial Stadium. The kick-off between the juniors and senior girls is set for 6:30 pm. In the game, juniors and senior girls will reverse roles and play a version of flag football with the guys coaching and cheering. The Student Government Council is running the event as a fundraiser. The Class of 2018 will be trying to keep the tradition alive that the seniors come out winners. But the juniors will mount a challenge, and this year the tradition could be broken. In last year’s game the Class of 2017 narrowly beat the Class of 2018 12-6. Erika Ochenduszko scored the only touchdown in that game for the then juniors. Look to her to lead the way along with the other senior girls who have last year’s game as valuable experience. After an extremely successful service trip to Panajachel, Guatemala last year, RHS plans to bring 17 students and four teachers back again on another service and learning trip over February break. The trip is supported by Worthy Village with the goal of teaching Guatemalan villagers about hygiene and safe drinking water. In order to go, students are running fundraisers to help raise money for the trip. Tonight, at Chipotle on Derby Street, Hingham the kids have set up a fundraiser where 50% of the proceeds from buying dinner there between 5-9 will help offset the costs of the trip. Be sure to bring in a flyer, show the cashier on your phone, or tell them you are supporting RHS in order to impact the cause. In addition to that, every Tuesday in November at Not Your Average Joe’s a portion of the proceeds will be donated to the group in order to directly impact the lives of the people of Lake Atitlan, Guatemala. If you’re still looking for more ways to make an impact, drop off any spare soft items such as clothes, towels, blankets, etc. from 9-1 in the High School Parking Lot on Saturday December 2nd. These goods will be donated to Savers via their FUNDrive program and will also benefit our kids!